Jean is mum to William, Tara and Emily. Nine year old Emily has autism and her condition means that she doesn’t sleep very well, but has an endless supply of energy. She also cannot speak but is learning to use sign language to communicate. As well as being a busy mum Jean founded the New Hope project after discovering the lack of facilities for disabled children in her area. The New Hope project, which opened in July 2010, now caters for fifty families from all over Worcestershire. The project provides daytime respite care and gets children out and about during school holidays and on weekends. Jean runs the project voluntarily as well as looking after Emily and organising fundraising events. 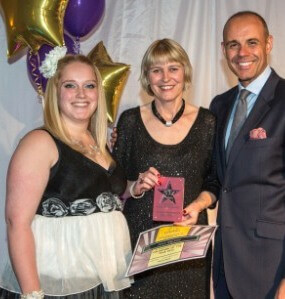 To recognise her tireless work Cerebra awarded Jean ‘Volunteer of the Year’ at the 2012 Children’s Awards.